The big reason we want to use an FM radio is so we don’t bug our neighbors with a constant loop of music blasting outside in the neighborhood for a month. FM is also a quick easy way for our audience to tune in and enjoy. We can legally broadcast a low power station, just enough so that cars in sight can pick up the audio while watching the lights. With the help of a radio locator website that tells you vacant FM radio stations in your area, we chose FM 87.9 MHz. The sign itself is 18″ x 54″ which is plenty big to be seen and read as people drive by. I made a PVC/bungee structure to hold the sign during the display. For the 2013 show we made a custom tune-to sign that is fancy enough to warrant it’s own page! We also made a custom tuned dipole antenna for FM 87.9 MHz that our Vast Electronics V-FMT212R uses for transmission. I have done extensive testing of the various power settings and we have things tuned such that the signal is great for just a few house radius, which is perfect so we don’t anger the FCC! As licensed Hams, neither Tiffany nor I want that! Low power? How low exactly? The FCC desginates a 200ft. radius for unlicensed low power broadcasts. The FCC website details for that are here: http://www.fcc.gov/guides/low-power-broadcast-radio-stations. We use a relatively new FM transmitter that is becoming more popular with the DIYC community in the last year or two. It is a small USB-powered transmitter that is well suited for the low power type of setups typically associated with Christmas Displays. In addition to having a low transmission power, it is actually powered by the USB port and is implemented as a generic USB-audio device so it works in linux for audio, out of the box. Finally, the dipole antenna I made enclosed in PVC. 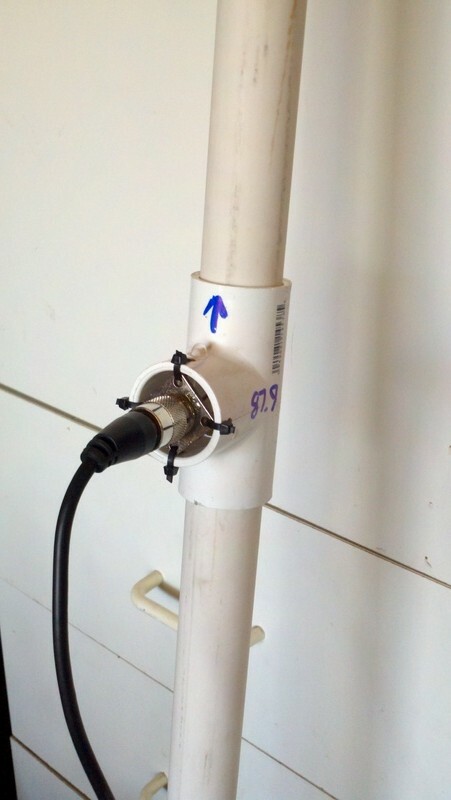 I used 1″ PVC and somewhat followed this guide to make my dipole. To attach the common copper cable, my soldering iron couldn’t get the SO-259 connector hot enough, so I used a propane torch just long enough to solder the wire without (completely) melting the coax insulator. Through some google searches and hints from people on DIYC, I found out that old versions of the control software that Vast distributes for Windows™ was originally released. In addition, the µc that’s used has some other projects, so there are some decent resources available on how to talk with the device for capabilities like transmit frequency, power output, deviation, and RDS data. Upon looking into the existing code available, it turns out the control software was written in Qt and therefore should be cross platform. Sure enough, it compiles successfully (and relatively easily) for linux on my Debian machine. I was able to dig into the code and easily take the “fmtx” file, which is what makes the USB calls using libusb-1.0 to the actual FM modulator. There wasn’t too much in the way of documentation, but the header file groups similar functions together and has relatively easy to understand variable names and types. Using this API I was able to write a control application that I’ve tested on both my desktop linux machine running Debian, as well as on the Raspberry Pi to work with FalconPiPlayer. I also wrote some initial plugin support into FPP that will make it extensible so people who have hardware that isn’t officially supported can be made to work within FPP easily.